Sent to sing Mom’s praises or to entertain another special someone, this magnificent medley of roses and lilies will no doubt summon a standing ovation. 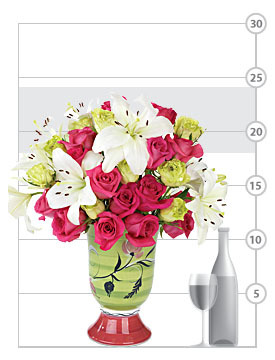 Hot pink Taiga and Super Green roses arrange themselves in perfect harmony with our white Asiatic lilies. And the show’s not over yet. The curvy ceramic vase handmade in the U.S.A. by Gail Pittman is a gorgeous keepsake that will hold future bouquets or perhaps a bottle of your finest wine after the flowers take their final bow. Remove all foliage that will fall below the water line. Remove the “guard petal” on each rose – this is the outermost petal left on to protect the bud during shipment. You may also remove any petals that may have slightly bruised during shipping. We recommend cutting all stems underwater for best blooming results. As the lilies open, you may gently pull off the pollen anthers to avoid pollen dust. Be careful not to get lily pollen on your clothing or linens. You may wish to place a protective mat under your bouquet to prevent pollen from falling on your furniture or carpet if you do not remove the anthers.